Initially started as a prepaid mobile recharge website was used to make payments for limited utilities. Over the years, this portal has expanded its scope and has brought about anything and everything under the ambit of its operations. This gave the option to small vendors to list their products on the website and allows them to expand their customer base. Vendors from tea-sellers to big retail stores can now accept quick digital payments without any hassle and at mere cost. But this magical transformation on how Indians Transact, invited new kinds of scams. Wherever the technology moves, scammers follow. As like the Cat and Mice game, scammers have now found a new way to rob vendors over the Paytm Transactions. It is easy, very easy to scam people. You just should understand how people behave in general scenarios and then exploit that behaviour. Just when digital transactions are catching on, through mobile wallets and mobile applications, cyber crooks have come up spoofs for these too. Let us take an example, you go to a nearby restaurant and order food. The restaurant accepts payments through Paytm. Upon seeing this you decide to pay via Paytm and scan the code on your smartphone, put the amount and make payment. Within seconds flashes the Payment Receipt, you show the receipt to the Restaurant cashier, he agrees and you happily leave. In the above scene, did you find any bug? The restaurant cashier blindly trusted the receipt you displayed on your smartphone. Whereas he must have checked the payment receipt on his smartphone or confirm the receipt on his account. That’s where the new bug lies, and cyber crooks have already have come up with innovative ways to fool Paytm merchants and vendors. What if instead of making the full payment through Paytm, you just showed a fake Paytm payment receipt and the restaurant cashiers trusted? This is where the creative cyber crooks have created ways to do so. 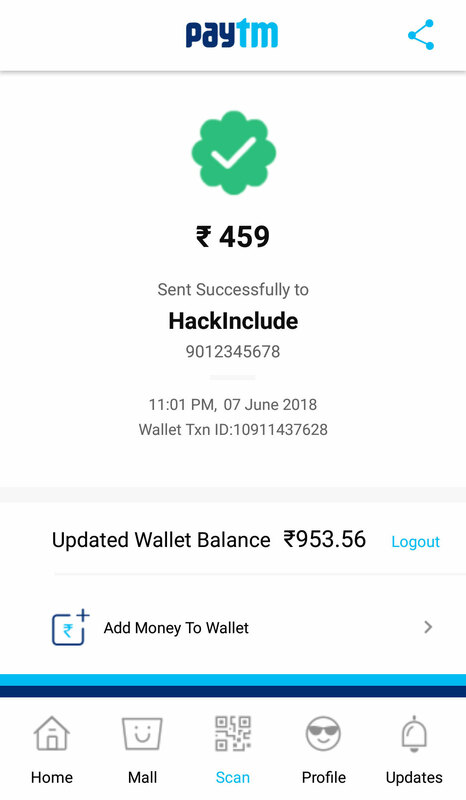 Cyber thieves have already created fake receipt generator apps for Paytm. You just need to enter the name of the Receiver, amount to be sent and other details such as fake wallet amount and date. You can customise almost everything to be displayed on the payment receipt and generate. In no time your screen flashes the Payment Completed Screen, along with a fake Order Id and everything that a real Paytm receipt has. There is no possibility that anyone can identify a notable difference between a dummy and true receipt. This way anyone can easily fool the vendor or payment receiver. This can turn up into a huge fraud where fraudulent people can make payments of higher amounts in return of goods are services. The whole scam mentioned above is based on careless human behaviour. So next time when you are accepting a payment through Paytm, always cross check whether you have received the amount in your account. We should not trust if we receive an SMS by the name of Paytm, because these messages can be easily faked with dummy id. Accepting Paytm payments blindly trusting the customer is equal to accepting the fake currency. Fraudulent people are everywhere and we should not be trusting anyone. To prevent such kind of scams, end-user education is the only key. There is no way Paytm (The Company) involved in this scam but it is the fraudulent users who cheat on the less tech-savvy people.